Sets pods from the base to the top of the vine plenty for canning! Straight, smooth 6-in. pods are crisp and stringless at all stages, never limp. They cook up tender, with full-bodied Blue Lake flavor. 63 DAYS. FormUpright, annual. Climbing vine, must be staked. Spacing6 inches apart in rows 48 inches apart. FruitTender, stringless, round, dark green pod with white seeds. Seed Count2 oz. packet is approximately 150 seeds, 1/2 lb. is approximately 600 seeds. CommentsProlific climber. Sets pods from the base to the top of the plant. Stringless. Never limp or rubbery. Heavy yielder. 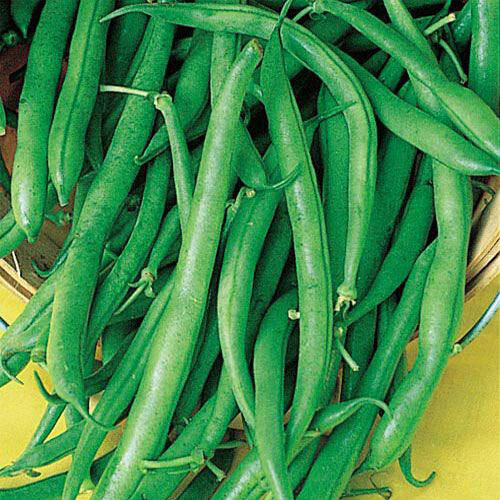 Also refer to pole bean culture. Yield150 pounds per 100 foot row. Botanical NamePhaseolus vulgaris 'Blue Lake'; Family: Fabaceae/Leguminosae (Bean Family). Size5 - 6 inch pods.